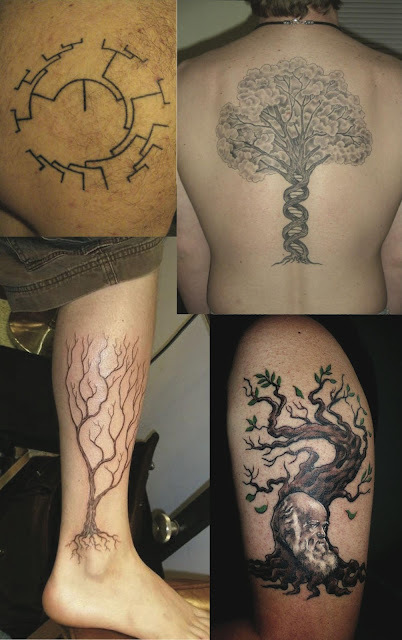 These are the last of the tattoos that I have for you — there are only so many exhibitionists in the world of phylogenetics. That is, as N approaches infinity the probability of N+1 approaches zero, where N is the size of the set of known phylogenetic-tree tattoos. I have been unable to locate any phylogenetic networks imprinted on the bodies of young persons, at least among those bodies publicly displayed on the internet. Perhaps networkers prefer to put their designs on t-shirts? Carl Zimmer (2011) Science Ink: Tattoos of the Science Obsessed. Sterling, New York. See also the previous posts: Tattoo Monday, Tattoo Monday II, Tattoo Monday III.